Yesterday evening I received a message from Ian Grant to say that on Thursday lunch time Terry was a car passenger that was involved in a serious road traffic accident which involved Terry being airlifted to Coventry hospital and Terry is currently in a coma. 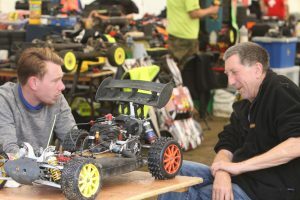 Some of the newer club members may not have met Ian or Terry since Terry had recently only returned at the 2017 LSOR Euros having taken a couple of years off to establish his mechanical career and family but they joined our happy world of rc racing and the large scale off road travelling national circus back in 2011. Only a few weeks back they were planning on attending the 2018 nationals. On behalf of the club I would like to send Terry, Ian and all there families all our thoughts for a speedy recovery. Cheers guys, fingers crossed we do.